The Norland Fiber Visualizer is a unique instrument which simplifies installation and testing of fiber optic networks. This compact unit uses a 0.5 mW helium neon laser, with an ultra-precision optical adapter, to focus high intensity visible light into the core of a fiber optic connector. As the light travels down the fiber, a visible red glow is emitted anywhere discontinuity occurs. The Visualizer imitates on the visible level, what normally occurs in the invisible infrared spectrum,thereby allowing the end user to actually see any problems in the system. As an installation tool the Visualizer is the ideal monitor for splicing fibers using a technique called Visual Splice Optimization (VSO). 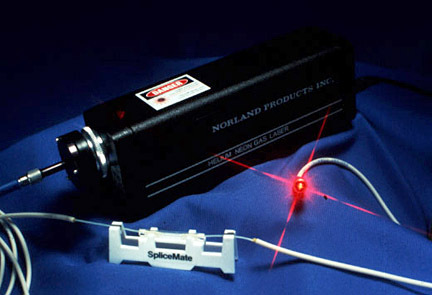 This technique can be used on the Norland UVC Optical Splice or any other mechanical splice which has a clear or translucent area where the fibers meet. With the Visualizer attached to the system,the splice will glow bright red when the cleaved fibers are inserted. As the fibers contact and the cores align, the red glow disappears because the light is transferred to the core of the opposite fiber. This sudden change from bright to dark provides instant visual feedback at the splice point making it obvious when light loss has been minimized. If a glow is still present, VSO allows the splice to be optimized by adjusting the fibers. As a test instrument, the Fiber Visualizer is useful for trouble-shooting typical fiber problems such as locating breaks and microbends in the fiber, tracing fiber for identification and locating bad splices or connectors. The advantage is in its simplicity. The feedback is an easy to understand, visual signal which occurs exactly at the problem site. The Visualizer is unique because it uses a safe, low powered laser to generate high optical output. The ultraprecision optical adapter focuses up to 90% of the laser beam into the fiber core and allows the light to be seen at a break more than a kilometer down the fiber. Even though the Visualizer uses a visible laser source, the power output is limited to less than 1.0 milliwatts. This categorizes it as a Class II laser which means it is safe for normal operation with the stipulation that you do not stare into the beam. This unit comes complete with a 12V AC adapter in a rugged carrying case with connector adapter for one of the following connector types: SMA, AT&T ST®. Biconic or D4 NTT-FC/PC. Also available is an optional battery pack for field use. Size 9" x 2" x 2.5"